This news story was published on February 2, 2019. As discussions about state school aid heat up at the State Capitol, questions have again arisen about how much the state is paying to cover lost school property tax revenue due to local tax incentives. 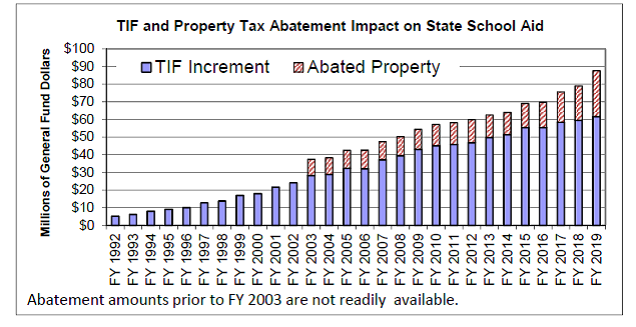 While some interests contend that backfilling TIF or abatements has no impact on the state budget, the facts say otherwise. The Tax Increment Financing program was established in 1992 as a method to help local communities finance community improvement projects. Under TIF, when a municipality (city or county) decides to set up a TIF project – known as an urban renewal area – the property tax from parcels within the project do not go to the levying authorities (school district, county, city, etc) but instead are used to pay for the improvements made to the urban renewal area. A school board or county board of supervisors that is not originating the TIF district does not have a vote to approve the use of their property tax revenue for this project. Schools are held harmless by the state, which replaces the lost property tax revenue through the school finance formula. Counties are not. The cost of backfilling the schools’ lost property taxes is something not easily found, as there is no budget line item for it. The funds needed to backfill the lost revenue are taken out of the General Fund before any action is taken on the budget. It is not accounted for in a manner like normal spending or even much discussed tax credits. When TIF was created by the Legislature, the law was written in a manner where the uniform school levy (aka the $5.40 levy)diverted to the TIF district would be replaced by state funding and thus there would be no financial loss to the schools. This process is part of the school finance formula, with the annual cost is built in to the annual calculation and no separate appropriation is required. When TIF started in 1992, it had a relatively small impact on the state budget of $5.2 million in backfill payments. But as the use of TIF has proliferated across the state, the hidden impact on the budget has grown significantly. In Fiscal Year 2019, the state is backfilling $61.7 million of school property tax payments diverted into TIF districts. Tax Increment Financing is not the only type of incentive that the state is replacing lost local property tax dollars. A number of property tax abatements also have the school’s share of taxes covered by the state. These abatements range from urban revitalization districts to data centers to forests and fruit trees. In FY 2019, the state will provide schools with $26.1 million to cover lost property tax revenue due to the abatements. With last week’s release of the annual Condition of Education Report (found here), a few areas of note are available for viewing. This week, in chart form, are stats on student and teacher statewide totals. 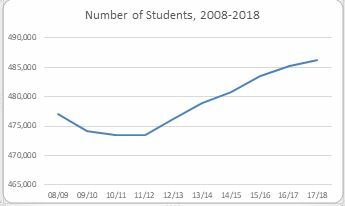 Student numbers have continued their climb, increasing for the 7th year in a row. The number of students last year reached 486,264. This is up 9,245 from 10 years ago and up 12,771 from the lowest number in the 10-year span (2010/11). 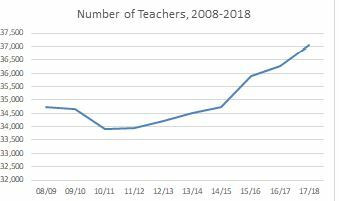 Teacher numbers have continued to climb as well, to meet the student demand. 10 years ago the number of teachers in the state was at 34,744. The latest number is 37,035, an increase of 2,291. During that period, however, teacher numbers dipped even lower to 33,916. Today’s numbers are 3,119 above that low-water mark. Both teachers and student numbers have increased, but has the teacher number kept up? Yes. The overall teacher/student ratio has decreased to another low. It reached 13.13 students per every teacher, down from 13.73 10 years ago and 13.96 at its highest point (2010/11). 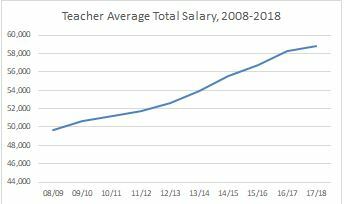 Salaries for teachers have continued to climb as well. Last year saw an increase to $58,765. This is up from $49,664 10 years ago, an increase of $9,101. For rankings nationally we held steady at 22nd in the nation and 5th in the Midwest. 22nd is not only the lowest in this 10 year span, but also by far the lowest over the past 2 decades. We reached 40th in the nation in 2005/06. While a few charts above looked at teacher/student ratio, that doesn’t actually show classroom size. It just compares the total number of students to the total number of teachers. Class size information is kept only for grades K-3 and efforts to reduce those numbers are helped by supplemental funding each year of over $30 million, started in 2008. Since that funding began, we are at our lowest numbers in this period: 19.5 students in Kindergarten, 20.0 in 1st grade, 20.6 in 2nd, and 21.3 in 3rd. During the 2018 legislative session, House Democrats voted to ban homeschooling and private schools in Iowa. That is not a hyperbolic sentence. It is a fact. Amendment H-8105 to House Joint Resolution 2009 added language to the resolution requiring all youth in Iowa to attend public schools. The language was clear and without exception. “Youth” is defined in various places throughout Iowa Code but in all cases it includes individuals under the age of 18. In some cases it includes college age Iowans. The word “all” does not mean “some” or those who choose to attend public schools and clearly does not provide any exceptions to students who choose to be homeschooled or to attend non-public schools. “Public school” clearly does not mean homeschool situations nor does it mean private schools. According to the Iowa Condition of Education Report, in the 2017-18 school year, 32,848 students attend non-public schools. Many of these schools are Catholic or Christian based schools. Requiring all students in Iowa to attend public schools means through the force of an amendment to the Iowa Constitution, seems extremely hostile to families who choose a different educational setting for their children. 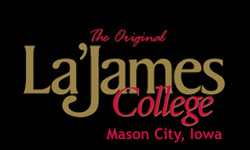 The Department of Education last week released the annual Condition of Iowa’s Community Colleges report. It includes data on programs and services, student enrollment and demographics, student success and completion, college costs and affordability, instructional staff salaries and characteristics, and financial information. The report also includes success stories that illustrate how community colleges impact Iowans and the economy. 131,144: The number of students enrolled in community college credit courses, down slightly from 132,694 the year before. It’s down from 141,226 in 2014. 51,001: The number of jointly enrolled students who earned college credit while in high school, up from 49,868 the year before. Jointly enrolled high school students account for 38.8 percent of total community college enrollees and 24.1 percent of total credits. 22.4%: The percent of community college enrollment from racial and ethnic minority groups, which represents a record high. 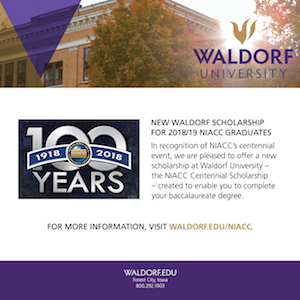 16,747: The number of credit awards earned (associate degrees, certificates and diplomas), down from 18,115 the previous year. 26,005: The number of noncredit program awards, up from 19,261 the year before. The majority of these awards (69.2 percent) were industry-awarded credentials designed to lead to or enhance employment opportunities. In addition to the Condition of Iowa’s Community Colleges report, disaggregated data tables and interactive data visualization tools are available on the Publications webpage of the Department’s website. Correcting the FACTS ! Out Standing research ! This TIF bullchit has been played to the hilt . All the crooked elected officials and rich -richer corporations – Windmills/chemical plant/Ethenol storage plant- honestly we don’t know any local common person who has a full time there except the owners and secretary. There use to be a requirement they had to hire so many employees but we guess that was eliminated. Lasted one was Bartz/Walk 80 million dollar Alliant energy pipe line which has come out in the open and exposed as a gift to the rich. No ! The moron in the red and white plaid pants said it okay to kill babies up to 9 months -if they exit the womb they will be kept comfortable until we decide weather or not to kill them, – – infanticide/murder – this guy just said = Do you know how hard it is to get black shoe polish off your face – Thank GOD for Donald Jay Trump ! This article is incorrect when it says TIF was established in 1992. TIF was created in the late 70’s and the Southbridge Mall project was one of the first TIF failures in Iowa to use TIF. Tax Increment Financing was sold to the voters of Mason City to get them to vote in favor of the of project. Mason City taxpayers were told Southbridge would not raise our property taxes to pay off the 7 million dollars GO Bonds to build the mall. TIF would pay for it! The mall went bankrupt and the malls property taxes were cut, and the City Council and Mayor raised our property taxes to make up the difference. States All Across America Passed TIF Laws back in the 70s! More importantly TIF or Tax increment Financing is a Socialist concept that was “thunk” up in a liberal think tank back in the late 60’s and early 70s. It is used to “spread the wealth” and use taxpayers’ money funded projects, to keep money flowing in local communities and to keep America’s economy from going into a Depression. Biggest problem for taxpayers is, TIF only spreads the wealth UP and not to the middle class. The think thanks knew that when America transitioned from an Industrial Based Economy to a Service & Information Based Economy that tax money was going to be needed to keep America’s economy from going into a Depression. It is only when you “Grow, Mine, or Produce a product” can you create the new money that is needed to keep the economy from tanking. Be aware, TIF is not the only Government Socialist program that America uses to spread the wealth. Sadly, all these Socialist programs take from the worker bees and pass it up the rich and powerful but that is another whole discussion. Fact is, Socialism is a failed concept worldwide, but it is repackaged in America and sold as a great tasting food or drink. Well, TIF has left a bad taste everywhere it is used. Only the rich and powerful enjoy the flavor. I agree with this. I have always said it was a hidden rip off. And to further set the record straight, the city ended up paying off the mall to the tune of 25 million about 10 years ago. To old council men told me that years ago. As far as H-8105, it is unconstitutional. You cannot compel a student to attend a public school. A parent has a right to educate their children outside of traditional public schools, especially when it is based on legitimate religious convictions. This was established in Wisconsin v. Yoder. Iowa can however, compel educational standards, again so long as it does not interfere with the free exercise clause. The bill is not compelling all children to attend public schools. You have to take into account that this article was put out by the Republicans. The bill states “The state shall provide all youths of this state with an education through a system of public schools.” What it mandates is that all children in this state can attend public schools.’Shall provide’ means that there must be institutions that provide a free education. It says nothing about a child must go to a public school. You better plug your liberal mind in ! Quote : Take the baby out of the womb make it comfortable until the mother and phych decide what to do – if nothing the baby dies and you LIE! Sorry but you are wrong and not including all the governor said. He stated “If a mother is in labor…the infant would be delivered. The infant would be kept comfortable. The infant would be resuscitated if that’s what the mother and the family desired, and then a discussion would ensue between the physicians & mother” He never said he would kill babies after they were born. He said an abortion would NOT be performed if the mother was in labor. The baby would be delivered and if it was stillborn or not breathing, if the mother okayed it, the baby would be resuscitated. He never said what you and others are claiming. You lie. We have this disease called TIF all over worth county – seems the corporate owners and elected officials who helped put them in place are the only ones seeing any GREEN ? It’s like that crooked governor in West Virginia – Took 3 MILLION dollars from PLANNED PARENTHOOOLUMS then announces it’s okay to kill babies after they are born ? As my daddy once said like out in the old west – just take him out back and hang him – maybe this is why the demorat party has been cutting down all the cotton wood trees. He did not say it is ok to kill babies after they are born. You are lying. Yes, he did and you are the one who is lying. Oh look another liberal with a superiority complex. I wonder are you able to walk upright without help, Do you wear gloves or just band aids to keep your knuckles from scraping the pavement when you walk? Has it been a challenge surviving with an IQ three points below plant life?